Pope Francis has addressed the mystery of why he withdrew his hand from worshippers' kisses, explaining it was a "simple question of hygiene". "It was a simple question of hygiene," Mr Gisotti explained on Thursday, telling reporters that he had asked Pope Francis about it. Mr Gisotti said that with so many people queuing up to see the pontiff in St Peter's Square, he was mindful of the risk of spreading germs. The 82-year-old head of the Catholic Church was said to be "amused" by the controversy, a papal aide told Reuters news agency. Mr Gisotti added that the Pope "likes to embrace people and be embraced by people", and that he was happy to let people kiss his papal ring in small groups. An extended version of the footage that swept social media shows Pope Francis allowing dozens of well-wishers to bow down and kiss his hand without protest. Kissing it - a tradition thought to date back hundreds of years - is considered a mark of respect and obedience. 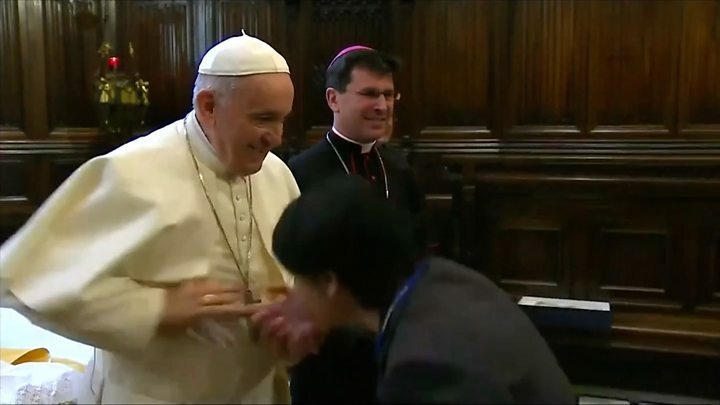 Video Is Pope Francis kissing goodbye to ring tradition?